A planet is a celestial body orbiting a star or stellar remnant that is massive enough to be rounded by its own gravity, is not massive enough to cause thermonuclear fusion, and has cleared its neighbouring region of planetesimals. 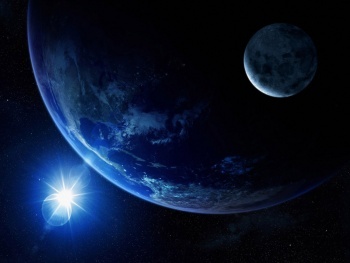 The term planet is ancient, with ties to history, science, mythology, and religion. The planets were originally seen by many early cultures as divine, or as emissaries of the gods. As scientific knowledge advanced, human perception of the planets changed, incorporating a number of disparate objects. The planets were thought by Ptolemy to orbit the Earth in deferent and epicycle motions. Though the idea that the planets orbited the Sun had been suggested many times, it was not until the 17th century that this view was supported by evidence from the first telescopic astronomical observations, performed by Galileo Galilei. By careful analysis of the observation data, Johannes Kepler found the planets' orbits to be not circular, but elliptical. As observational tools improved, astronomers saw that, like Earth, the planets rotated around tilted axes, and some shared such features as ice-caps and seasons. Since the dawn of the Space Age, close observation by probes has found that Earth and the other planets share characteristics such as volcanism, hurricanes, tectonics, and even hydrology. Planets are generally divided into two main types: large, low-density gas giants, and smaller, rocky terrestrials. Since 1992, hundreds of planets around other stars ("extrasolar planets" or "exoplanets") in the Milky Way Galaxy have been discovered. As of December 2010, Earth has discovered over 500 known extrasolar planets are listed in the Extrasolar Planets Encyclopaedia, ranging from the size of terrestrial planets somewhat larger than Earth to gas giants larger than Jupiter. A star is a massive, luminous ball of plasma held together by gravity. At the end of its lifetime, a star can also contain a proportion of degenerate matter. The nearest star to Earth is the Sun, which is the source of most of the energy on Earth. Other stars are visible from Earth during the night when they are not outshone by the Sun or blocked by atmospheric phenomena. Historically, the most prominent stars on the celestial sphere were grouped together into constellations and asterisms, and the brightest stars gained proper names. Extensive catalogues of stars have been assembled by astronomers, which provide standardized star designations. 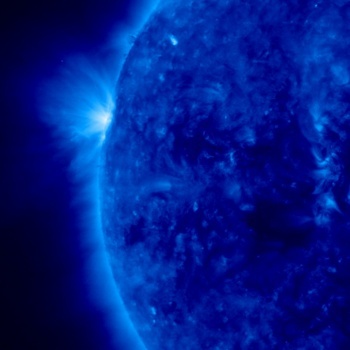 For at least a portion of its life, a star shines due to thermonuclear fusion of hydrogen in its core releasing energy that traverses the star's interior and then radiates into outer space. Almost all naturally occurring elements heavier than helium were created by stars, either via stellar nucleosynthesis during their lifetimes or by supernova nucleosynthesis when stars explode. Astronomers can determine the mass, age, chemical composition and many other properties of a star by observing its spectrum, luminosity and motion through space. The total mass of a star is the principal determinant in its evolution and eventual fate. Other characteristics of a star are determined by its evolutionary history, including diameter, rotation, movement and temperature. A plot of the temperature of many stars against their luminosities, known as a Hertzsprung-Russell diagram (H–R diagram), allows the age and evolutionary state of a star to be determined. Star Classification within United Federation Starfleet is very similar to Planetary Classification with letters to distinguish between the certain characteristics of that type of Star. It is important to note that all Star's are different and may show characteristics of more then one established Class of Star. When this occurs, usually the Star is labelled into its own Class which is relayed to United Federation Starfleet Science for confirmation before being added to the database. Stars are usually classified by Temperature and Composition, although surface area may serve as a distinguishing factor. Stars can also be classified by the apparent "colour" of the light that they produce, for example, a "Class A" will usually be of a "light blue" colour. A Nebula is an interstellar cloud of dust, hydrogen gas, helium gas and other ionized gases. Originally, nebula was a general name for any extended astronomical object, including galaxies beyond the Milky Way (some examples of the older usage survived, for example, the Andromeda Galaxy was referred to as the Andromeda Nebula before galaxies were discovered by Edwin Hubble). Nebulae often form star-forming regions, such as in the Eagle Nebula. This nebula is depicted in one of NASA's most famous images, the "Pillars of Creation". In these regions the formations of gas, dust, and other materials "clump" together to form larger masses, which attract further matter, and eventually will become big enough to form stars. The remaining materials are then believed to form planets, and other planetary system objects. Many nebulae or stars form from the gravitational collapse of gas in the interstellar medium or ISM. As the material collapses under its own weight, massive stars may form in the center, and their ultraviolet radiation ionises the surrounding gas, making it visible at optical wavelengths. Examples of these types of nebulae are the Rosette Nebula and the Pelican Nebula. The size of these nebulae, known as HII regions, varies depending on the size of the original cloud of gas. These are sites where star formation occurs. The formed stars are sometimes known as a young, loose cluster. Other nebulae may form as planetary nebulae. This is the final stage of a low-mass star's life, like Earth's Sun. Stars with a mass up to 8-10 solar masses evolve into red giants and slowly lose their outer layers during pulsations in their atmospheres. When a star has lost enough material, its temperature increases and the ultraviolet radiation it emits can ionize the surrounding nebula that it has thrown off. The nebula is 97% Hydrogen and 3% Helium with trace materials. The main goal in this stage is to achieve equilibrium. Nebula classification is somewhat different and more interesting then Planetary and Stellar Classifications. Both letters, for example "Class J" and numbers, for example "Class 17" are used along with certain names almost attributing to starship classes for example, "Mutara Class". Nebula's are usually grouped together because of certain physical characteristics which can be difficult to understand as some nebula's are visually very similar, for example "The Azure Nebula" which was "Class 11" and the "Class 17" that was encoutered by the USS Voyager in 2372 which were both visually similar although internal scans revealed that they were absolutely nothing alike. A spatial anomaly is a very broad term for any sort of extraordinary disruption in the space-time continuum. Often, they can take the form of irregularities in gravity, ripples in space that can damage equipment and personnel, alterations in the laws of physics, and areas of disruption inimical to the Human brain. The Delphic Expanse was rife with such distortions, generated by massive spheres created by the Sphere Builders, meant to reconfigure space to resemble the trans-dimensional realm from which the Sphere Builders hailed. The Triannons referred to the anomalies as "the breath of the Makers." 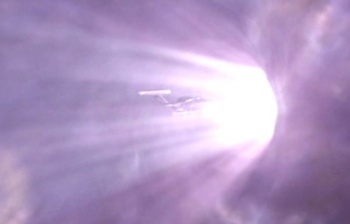 The USS Enterprise-D once encountered a spatial anomaly, which turned out to be a multiphasic temporal convergence in the space-time continuum, caused by an eruption of anti-time. 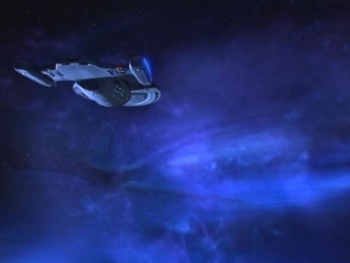 Another was encountered by the USS Voyager in the Delta Quadrant, and turned out to be a graviton ellipse: an extremely rare spatial anomaly that travels through subspace, emerging into normal space occasionally and without warning. Since new anomalies are encountered regulary and come in many different sizes and shapes, it can be difficult to catagorise them. Classification of anomolies is a constantly changing process that requires consant updating however, certain types of anomolies have been grouped together for easy reference and in an attempt to classify them. United Federation Starfleet uses the "Bower's Classification System" for identifying and classification of spatial anomalies. This page was last edited on 28 May 2011, at 18:42.